CubeBackup - How do you solve the &#34;Authorization failed&#34; error? 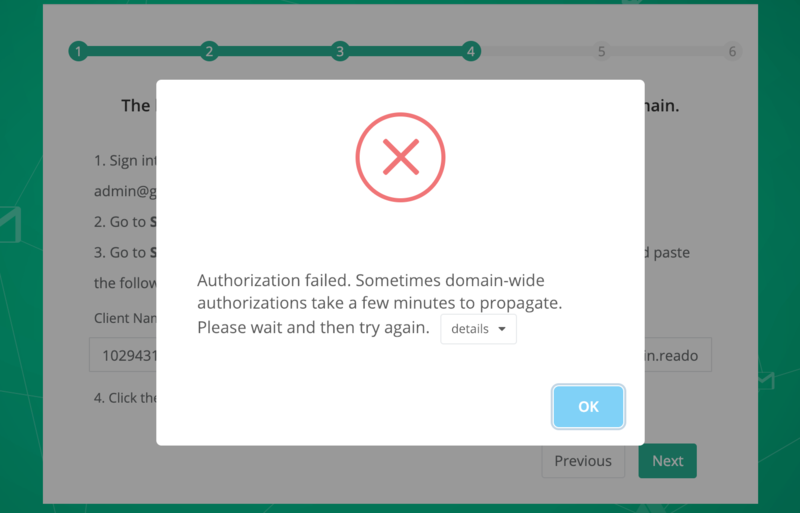 How do you solve the "Authorization failed" error? The initial setup of CubeBackup can sometimes be a little complicated, and a few users have run into an “Authorization failed” error when clicking the Next button during the initial configuration of CubeBackup. 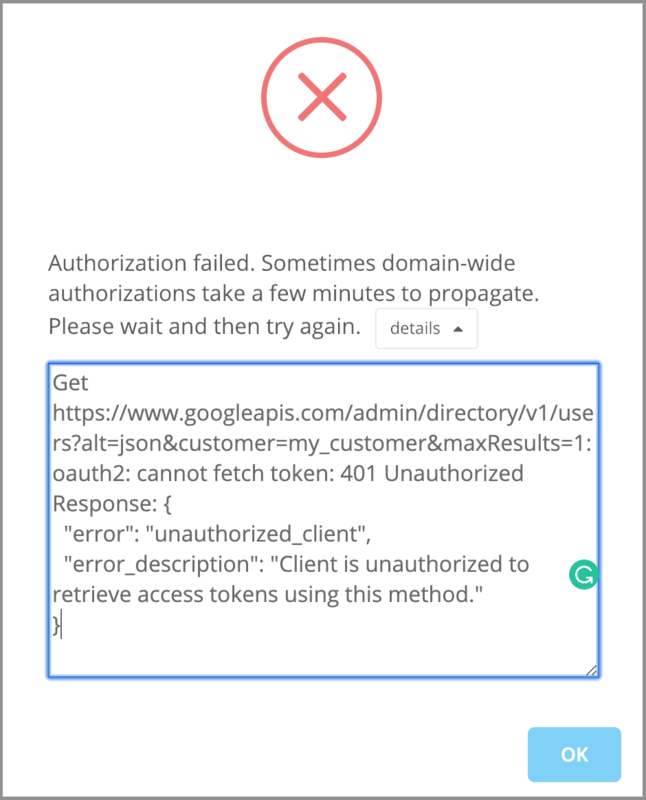 G Suite domain-wide authorizations need time to propagate. This can take anywhere from a few seconds to a few minutes. Often the problem can be solved by simply waiting a couple of minutes before you click the Next button again. In a few very rare cases, the propagation process may take several hours. The clock on your server/VM may be incorrect. Please ensure that the date, time, and time zone is correctly set. CubeBackup relies on Google APIs to get data from Google. Any Google API requests require a correct timestamp. Please check the clock on the server and keep it synced with a public NTP server. Are the Admin SDK, Drive API, Calendar API, Gmail API, and People API enabled in Google Cloud console? You can quickly confirm by checking the API list in APIs and Services -> Dashboard. The Client Name in your GSuit admin console -> Security -> Advanced settings -> Manage API Client access should be the created Service Account’s client ID (e.g. :10847638222459), not an email address. Make sure that Enable API access is checked in GSuite admin console -> Security -> API reference -> API access. Generally, “Enable API access” is usually checked by default. Please ensure that www.googleapis.com port 443 and imap.gmail.com port 993 are not blocked by your firewall/proxy. As long as you can receive Gmail messages using a mail client, such as Outlook or Thunderbird, this problem should not be related to your firewall settings. If you’ve tried all of these and the problem persists, please expand the “details” button on the error dialog and send the detailed error message to support@cubebackup.com.